METHOD: Take the 3 boiled, grated potato in a bowl & add little soft butter (1Tbs), some salt & black pepper. 1. 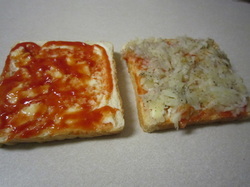 Take a slice of bread & spread butter & ketchup. Apply the potato layer on top. 2. 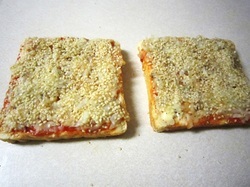 Sprinkle sesame seeds on the potato layer to cover it. till its lightly brown & crispy. You may even broil/grill 1-2 min to cook & lightly brown the potato/seed layer. Cut each slice into 4 squares. 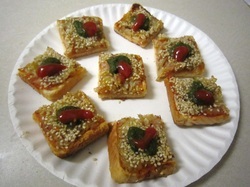 Decorate with green coriander chutney & ketchup. Serve hot. 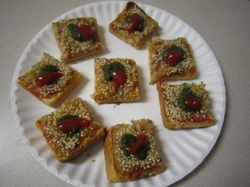 This is a very delicious healthy tea time snack which I learned in college during my cooking course. Its colorful, tempting and great as a party snack. Note: This recipe is oil free as its not fried but baked except for some butter in the potato mix for flavor. Susej Bose suggests other toppings like scrambled eggs instead of potatoes. He says, "instead of ketchup, tamarind or mint is my selection. I am daily trying your combi's and they are working out very well."